Pure Water Gazette » The Immortal Jellyfish. Why Do We Know So Little About It? In 1988 a young German Marine-Biologist captured and began observing a fairly rare marine creature known to biologists as Turritopsis dohrnii. The creature is now commonly referred to as The Immortal Jellyfish. After several days he noticed that his Turritopsis dohrnii was behaving in a very peculiar manner, for which he could imagine no explanation. Plainly speaking, it refused to die. It appeared to age in reverse, growing younger and younger until it reached its earliest stage of development, at which point it began its life cycle anew. All this, of course, flies in the face of our most basic assumption about our world: “first you are born, then you die.” The jellyfish, though, acts like a chicken that can turn back into and egg which hatches and grows again into a chicken which then turns back into an egg, and so on. Although there is strong reason to believe that the simple creatures of the sea hold secrets that teach of immortality and the cure of cancer, there seems to be little will to study them. For example, cancer funding, which is high dollar business, is directed toward the study of actual cancers and drugs that can be used to make money. 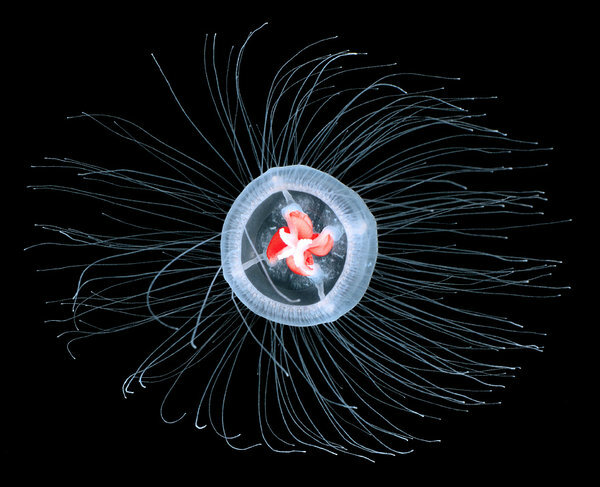 “Venture capitalists” do not want to open their pockets on long-shot studies of jellyfish. There is also the problem that there are so few experts in hydrozoans. Few want to make a career of studying jellyfish when there are sexier creatures to be examined. It is also a very difficult research area because hydrozoans don’t like laboratory life and are tedious to maintain as research animals. That doesn’t erase the fact that we may be looking in the wrong places. One scientist says that to learn about life we need to look at the roots rather than the tree. The simple creatures of the ocean have much to teach us. For the full, fascinating story of the immortal jellyfish, you should read the full article from the NY Times.